Relaxing and Serene with a Spacious Floor Plan, Views, Beach Access and Even a Totem Pole! You cant beat the view from the living room and deck. The cabin is right on the river (fast like a stream but wider while we were there in mid-late May). It was quiet and private. There is a cabin on the adjacent property separated by some vegetation (there wasnt anyone there during our stay). A fox came for a drink right across the river from the cabin shortly after we arrived. We saw Bald Eagles flying about as well. The location was ideal for us, allowing day trips to Cape Flattery and Hobuck Beach (both of which we highly recommend), and the Hoh Rainforest. Renting was easy, as was check-in and check-out. The property was in very good condition, well-equipped with all we needed in terms of kitchen stuff, towels, etc. The only thing we found a bit unusual (at least to us) was the lack of a master bathroom door. The master bedroom has a door, and there is a second bath with a door, so we got on just fine. To us this property more than qualified as a 5 star stay. Were very happy we stayed here and would do it all over again. We loved the quaint and quirky cottage. The view was spectacular and we also enjoyed watching the work at the lumber yard below. House was CUTE, clean and very well stocked. Loved the setting! Sitting out on the porch watching and listening to the birds was our favorite feature. The house is very clean, comfortable and spacious. The views of the beach and mountains are lovely. We would love to come back. The beach house is absolutely beautiful. The beds are wonderful and super comfy. The kitchen is fully stocked and there is a view out every window. We loved our stay here! Very responsive staff phoned with requested info. Pleasant, helpful staff at check-in. Loved the view from 3 rooms of deer & bay. Amenities were very good, want to return. We arrived late on Saturday afternoon, but Lyle didn't seem the least bit like there was someplace he'd rather be. He was very patient, and knowledgeable, and thorough. We sent an email about whether or not there would be a hair drier, and we got a very prompt reply that there was one. Thanks to all for a great experience. We looked at several vacation rentals last Summer and again on this trip, online and actually doing visual driving excursions. I think what we liked best about Bay Breeze was its location--specifically being close enough to the "base" of the spit to actually see & hear the waves against the beach! Also, being on a dead end street, it was really quiet. And the view out the "picture" window in the living room was to die for!!! We never even turned the tv on the whole four days we were there. I must confess that early in our stay, we turned the arm chairs around to face the window and literally spent hours just watching the deer, the birds, and the ship/boat traffic. One day we actually saw a Navy "flattop." Where to start....the location was perfect, the setting just beautiful and so well maintained from the horse stables to the pond area to the cottage itself. We so appreciated the bed and bath linens, new and perfect! The cottage was immaculate and comfy with a really nice deck featuring a lovely view. The own, Dan, was delightful and helpful with suggestions on where to go and what to do! We missed his wife, Debbie, but hope to meet her on our next trip back as there will be another trip back! An excellent choice! Don't miss it! The place was really clean and neat. Comfy furniture, cable TV, stereo ( no aux jack). Nice outdoor patio and view just as nice as described. There is a telescope to help look at ships coming and going. Kitchen has all the equipment you need- some odds & ends condiments/spices also there. There was laundry detergent, dishwasher detergent, bar soap (hotel style) but no shampoo. Driving up to the cottage may remind you of a back alley- but no worries, it is really a street and very quiet neighborhood. I definitely would stay again. My husband and I enjoyed our 4 night stay in the beautiful apartment. The apartment was spacious, beautiful, warm, quiet and relaxing. Loved the king bed with luxury hotel bedding and the fabulous bathroom with endless hot water! Best part how centrally located the apartment is to several attractions, hiking trails and walking distance to the Dungeness Spit. We're definitely book apartment again next year for another vacation to Sequim. We enjoyed this relaxing spot overlooking Dungeness Spit. I loved the neighborhood deer, and watching the ships pass by. On a clear night, you can see a sky full of stars. The house is nice, clean, and cozy with comfortable beds and a collection of games and puzzles. We heartily recommend this charming place to travelers of any age or interest. We were two "mature" couples - one from Seattle and one from Montana. It is a perfect place for two couples or a family of four or five. The "cottage" is actually a well appointed, tastefully decorated small house down a pretty country road. The front porch, with four comfortable Adirondack chairs is a great place to drink a morning coffee and watch the sun rising in the east and the tranquil view of the little pond with ducks swimming in the reeds. Actually, it's a great place to sit all day. In the evening, you can sit in more Adirondack chairs on the back side of the house to watch the sun set over another pretty meadow as you wait for your barbecue to be finished. In addition to two nice size bedrooms and baths, there is a sofa bed in the living room that could allow an expanded group. The kitchen is fully equipped and functional. After a fresh crab dinner and the charming kitchen table, the 94-year-old in our group said with a big smile: "since this is heaven,I think I'm ready to die!" It is an easy drive to Sequim and Port Angeles and the glorious nature west of there headed to the ocean beaches. Coming from the east, we recommend a stop in the charming little town of Port Gamble near the eastern end of the Hood Canal Bridge. And a stop in historic Port Townsend is easy on the way or going back. Overall a great property with an absolutely fantastic view! The photos on the site do not do justice to the view you get. Loved our stay on this property. Loved everything about this place! It was even better than we expected! Great view. Great private beach access for exploring. The home is big and open, very clean, well stocked, and the beds are so comfortable! We would love to come back. The home is simple and elegant. Amazing view of sunrise. Very quiet and peaceful. Perfect home to relax and play. I love what you've done with this place. Your decorating style gives your home such a pleasant amiable feeling. I love it! We came from Everett for a family reunion on the lower Elwha reservation. Went hiking to the site of the US largest dam removal and kayaking on Lake Crescent. Very peaceful here. Our family's 3rd Labor Day weekend at The Cedars was another delightful experience. We're all good cooks with serious kitchen envy: appliances are older but high quality, plenty of counters and cupboards full of good pots, pans, and utensils, with big windows with views of the bay or trees. Plus a good gas grill outside. When it's not sunny enough to sit on one of the decks or hang out on the big lawn, there are multiple window seats perfect for day dreaming while watching birds, boats, and chipminks, or reading. 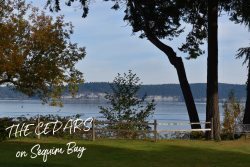 The guys love golf at 7 Cedars, the shoppers love Sequim, the plant nerds love Far Reaches Farm in nearby Port Townsend, and we all love dinner at the Dockside Grill at the marina. May not be the ultra modern luxury some people want but we've always enjoyed the peace and quiet of The Cedars.